Immigration has been a hot topic in the news for many months now, most recently with the current administration's announcement to end DACA. Unfortunate for the people adversely affected by the decision, but perfect timing for Theatre Unbound to open their 18th season of presenting the work of women artists and telling women's stories with Aliens with Extraordinary Skills. 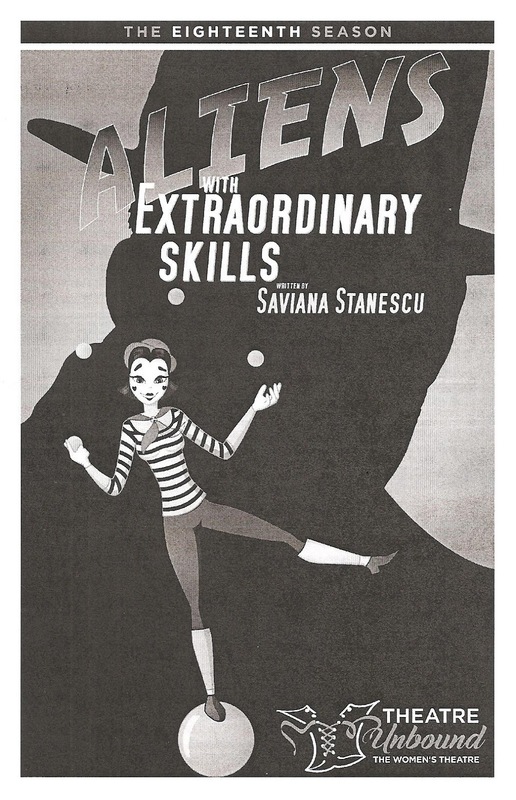 Staviana Stanescu, herself an immigrant from Romania, has written a sweet story about undocumented immigrant clowns who just want to do their work, make a living, and make people laugh. The winning cast brings the dark but charming story to life, showing just how difficult immigrant life is, even for clowns. Lulled with a fake visa, Nadia and Borat leave their home countries behind (Moldova and Russia, respectively) and move to America, land of opportunities. Nadia says that at home, people are too poor to laugh, so they hope to bring their clowning act to people who can appreciate (and pay for) it. When they learn their visas are fake, they decide to stay in the country and move to NYC. Borat leaves the clown business to drive a taxi, while Nadia makes a few dollars selling balloon animals and entertaining people on the streets. She rents a room from Lupita, herself an immigrant, but possessing the elusive green card while working as an exotic dancer with plans of becoming an actor. Nadia and Borat separately try to make it work in the Big Apple, but without documentation, you can't ensure your employer is treating you properly, and you can't go to the police when you're attacked for fear of being deported. But with a little help from their friends, including the creepy-turned-sweet Bob, Nadia and Borat's undocumented status comes to an end, in different ways. I really enjoyed this cast, most of whom I was not previously familiar with. Anna Sutheim is so wonderful and appealing as Nadia, creating a very sympathetic character whether she's cheerfully clowning or curled up on the couch after a traumatic experience. 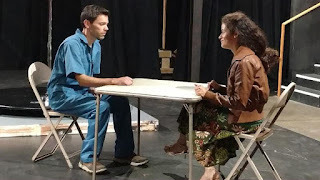 Adam Gauger is also great as the more practical Borat, and brought me to tears in a dramatic scene when I could see the real emotion on his face up close and personal in the intimate space. Stephanie Ruas is strong as the spunky and supportive Lupita (with, it must be said, the most fabulous hair). Matt Wall manages to turn this kinda creepy Craig's List guy into a sweet romantic prospect. Rounding out the cast are Benjamin Heer and Stephen Houtz as the INS agents who haunt the proceedings like ghosts. The play is performed at my new favorite theater space, or perhaps my favorite new theater space, Gremlin Theatre, which just opened this summer in St. Paul and is already booked with shows by different nomadic theater companies. The intimate thrust space works well for this story, and director Melissa Simmons uses it well. The simple set includes a couch and coffee table representing Lupita and Nadia's living room, a pole for Lupita's dancing, and the cutest little Fred Flintstone taxi that Borat drives (set and prop design by Ursula K. Bowden). Aliens with Extraordinary Skills is funny, poignant, and very timely, and deserves a bigger audience than was at the Sunday matinee I attended (which, granted, was one of the last beautiful days of the summer). I recommend checking out this sweet immigrant story, and you can make a night of it with a visit to Lake Monster Brewery right next door to Gremlin, which often has food trucks outside, and from which beer can be purchased and brought into the theater. Aliens continues through September 24, with tickets ranging from $18 to $22 and a pay-what-you-can night tonight!